The history of cotton cultivation and weaving in Mali dates from the Mali Empire. Sundiata is said to have introduced the cultivation and weaving of cotton into the area. In the 14th century the Mali Empire became rich trading cotton and salt. The cultivation of cotton and rice was encouraged under the French through large irrigation projects and a new railroad connected the interior to Dakar on the Western coast. 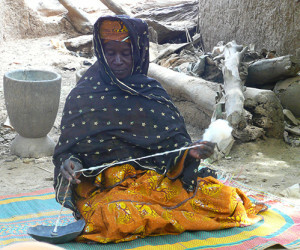 Mali is one of the largest producers of cotton in Africa. Most of the cotton is baled and shipped to Europe and the US with very little value added in Africa. Yet the spinning, weaving, dyeing of cotton in Africa has a long deep place in West African culture. Women spin the cotton, men weave it and women dye it. Cotton cards are a very deep cultural symbol. Everyone remember their mother or grandmothers spinning. The lack of cotton cards makes spinning difficult. 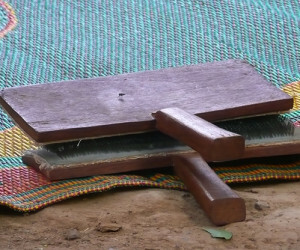 Before spinning the cotton into thread, it is first necessary to comb the fibers, like combing your hair, in order to produce a fine and consistent thread. In 1959 the factory in Ivory Coast that manufactured cotton cards for all of West Africa stopped producing cotton cards. Rural women are denied a livelihood due to the lack of the cards. 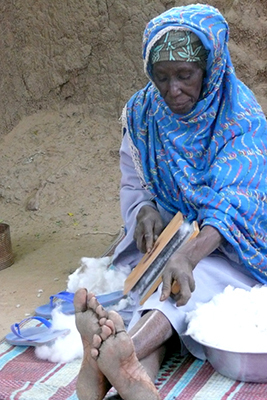 Janet began hearing about this lack of cotton cards from a couple of Malian friends many years ago. Since Janet began her art career as a fiber artist, she knew about spinning and knew she could find the equipment in the US. 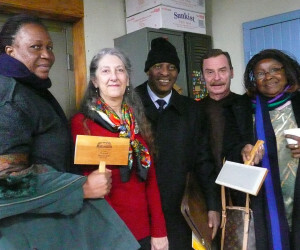 The next year, Janet returned to Mali with a few pairs for her friends. Both were shocked and thrilled to see new cotton cards. Over the years Lala and Janet continued to work on the project. Lala organized women in the village and tried to find funding to buy cards them. In 2008, the project was funded thru a USAID cotton project. 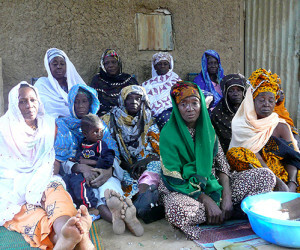 But all over West Africa there are rural women denied a livelihood, due to lack of the cards. * Consulted with the project director for many years to develop the project and business plan. * Acted as a cultural translator between the director and a USAID cotton project to get funding to purchase the cards. * Located the cotton card factory in the US and facilitated the purchase of the cards.